Impatient to get something going on my new quilt, I pieced together a couple blocks, and learned a few things! First off, the blue geometric feels all wrong. I'm not sure if its the color or the pattern (too geometric/harsh next to the more organic prints), but it feels out of place. Second thing, this approach, while it may work for others (super improv) I dont think its me. It's far too busy for my liking, plus, the "wonk" feels forced. I think I'm going to go with a subtler, purposeful wonkiness. Third, the pieced log in the block on the right - too much. I'm not feeling it, its too busy (not to mention the little hope valley scrap is too bold and sticks out like a sore thumb) But I do wish I had more of whatever dot/cobblestone print that blue scrap is...the color works perfectly. 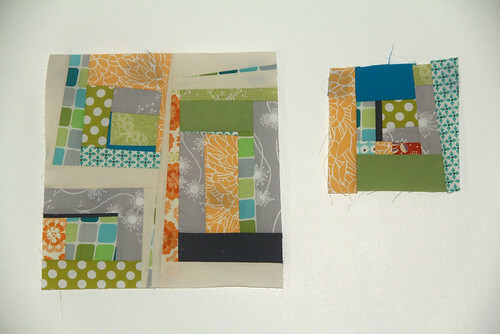 Fourth, I'm thinking in each block there will be either the yellow print or the orange. yellow and orange are very powerful colors, and can overwhelm a quilt pretty quickly, if you arent going for a yellow/orange quilt. Fifth, I am undecided on the kona coal (dark grey) bits. I like when there is small bits of it, but the large log is a bit too dark for my taste. Finally, the color palette isnt where it should be. I ordered a few more aqua prints, and will use the aqua to anchor it more. Perhaps when there is more aqua fabrics, the blue geometric print might blend in better. Thats it for now, hopefully my order will arrive tommorrow or thursday so I can get going on this more!